There always an abundance of new beauty launches around this time of year as we edge closer towards the Summer (if it ever arrives), and with so many new launches it can be hard to keep up. We've rounded up a selection of our favourite new drugstore beauty releases including makeup, skincare and haircare which we recommend giving a try if you want to try something new or you simply want to indulge in some online retail therapy. Real Techniques have launched three new brush duo sets for the eyes, one of which being the Real Techniques Eye Detail & Define Brush Set. This particular duo contains two Real Techniques eye brushes and an eyeliner tool too. The Definer Brush is a firm, slanted brush which is ideal for use along the lashline for winged liner and the Square Detailer Brush is a precision cut brush with squared bristles to help create small and precise lines. The third item in the set is really rather unique as it's a triangle shaped Liner Guide which you can place on the skin adjacent to the eye to help you create different liner looks for varying sizes of wings and even a double wing look. The Definer Brush is really effective for lining the upper lashline with cream, powder and gel formulas with the ideal density for precise lining and you can even use it to apply brow powders or brow pomades too. The Square Detailer Brush is unique to any other brush in my collection and I like to use it to tight-line my upper lid with powder or gel to give the illusion of thicker, more intense lashes and it's really easy to use as it's so small and precise. The Liner Guide is a nice addition to the set and is actually very effective when applying liner regardless if you're a daily eyeliner wearer or an eyeliner newbie, and it's quick and easy to clean after use. It would appear that Barry M are on a roll with their new releases and I have three of them to show you today. First up is the Barry M Illuminating Highlighter Palette which contains three generously sized highlighter powders alongside a mirror within the lid. Barry M describe the shades as being 'highly pigmented, radiant, soft focus shades' which are blendable over makeup. The highlighters are individually named too; Frosty Cream, Iced Pink and Gilded Bronze with Frosty Cream being a brightening shade for the high points on the face as well as the inner corners of the eyes. Iced Pink is a medium pink shimmer which you could use alone as an illuminating blush shade or as a blush topper and finally Gilded Bronze is a warm bronze shimmer which would look stunning dusted over the collarbones too. The second Barry M new launch we recommend trying is the Barry M Feeling Cheeky Sculpting Palette which is nicely packaged within a silver metal tin and again a mirror within the lid which is handy when travelling. This palette contains three different powder shades; a contour shade, a light powder shade to brighten and an illuminating powder to highlight as well as a little acetate guide showing you how best to use each individual shade. Sometimes contour palettes can be quite intense pigment wise but I like that this palette has a more buildable formula so you can opt for the intensity you want rather than going in a little too heavy handed. 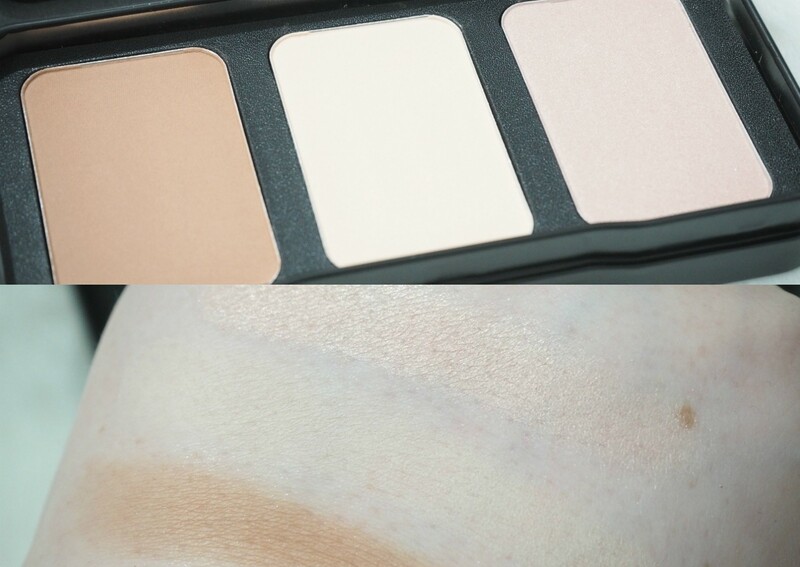 I think this would be a great starting palette if you're new to contouring as the guide is really helpful and the powders are very smooth and easy to blend. The Barry M Genie Lip Paint has been around for years and is basically a green lipstick which reacts with the PH level of your lips to create a custom pink shade and now they've introduced Neptune. Neptune is a blue lipstick with blue outer packaging and has been described as being a dupe for the Lipstick Queen Hello Sailor lipstick which is £22. The Neptune Lip Paint reacts to the alkaline of the lips to create a custom shade of bright pink for everyone. It feels so strange to swipe a bright blue lipstick bullet across the lips but it instantly turns into a bright purple toned pink shade. It might be a little gimmicky, but regardless of the colour changing concept, it's a comfortable and easy to wear lip colour which also stains the lips and why pay £22 when you get this Barry M version for under £5?! There are two new drugstore mascara launches which are well worth trying with the first being the L'Oreal Volume Million Lashes Feline Extra Noir Mascara. The mascara claims to have a 'legendary millionizer' brush which has been made arched for this mascara which I've never seen before and the arched shape is designed to perfectly fit the eyelid, resulting in intensity, curl and volume on every lash from root to tip. At first the arched brush looked a little strange but it actually makes sense to have a curved mascara brush as our eyes aren't straight and flat, so a curved brush really does suit the natural contours of the eye and you can coat more lashes with each coat due to the arched shape. One coat of the mascara offers great definition and length but a second coat really amps up the drama and intensity for lengthened, curled and intense looking lashes. It doesn't clump nor does it smudge or flake throughout the day making it a really good choice for everyday wear. If big mascara brushes don't work well for your lashes, the Bourjois Volume Glamour Push Up Mascara is a good alternative as it has a much smaller brush in comparison. The brush is quite small and slightly tapered with a little reservoir between each cluster of bristles which I find works well at coating the roots of your lashes especially when applied in a zig zag motion through the lashes. It claims to give an irresistible curl with boosted volume and length which I'd have to agree with completely and my personal favourite use for this mascara is for my lower lashes as I love the smaller, narrower brush for coating the little lower lashes. Even though the Clarins Instant Eye Makeup Remover is my personal favourite eye makeup remover, the new Simple Kind to Skin Dual Effect Eye Makeup Remover is a very close second. Just like the Clarins version, the Simple Eye Makeup Remover has a bi-phase formula with a cleansing oil in one part and a vitamin-enriched water phase in the other which will effortlessly dissolve waterproof makeup whilst being gentle and nourishing for your eyelashes. It doesn't cause any stinging of the eyes nor does it leave my eyes feeling greasy like some oil based removers can do, and as it dissolves your eye makeup quickly, there's no need to rub your eyes and I really like how gentle the formula is. I have to admit, I'm not a massive fan of the original Tangle Teezer, but I was instantly intrigued by the Tangle Teezer The Ultimate Finishing Hair Brush as I've never seen a brush quite like it before as it's been created to 'dry style' and finish your hair. The brush feels a little heavier than a standard hairbrush and has unique long teeth which lightly detangle and smooth cuticles for a high shine. It helps to achieve perfect up-dos, back-brush in volume and texture and to maintain and blend in hair extensions, clip-ins and weaves. I really like wearing my hair up but I hate how messy it can look when I do, but this brush is the ideal solution as it effectively smooths the hair and adds shine due to the polishing effect, plus the handle makes it easy to use. I'm loving Technic at the minute so I'm really enjoying more and more of their products. They have quite a few 'dupe' products where they've created something similar to an highend alternative. I'm not entirely sure the Technic Gold Treasury Eyeshadow Palette is a dupe of a specific product but the metal packaging is similar to the Urban Decay Naked 2 Palette. The palette contains 24 powder eyeshadows in long, vertical pans alongside a dual ended eyeshadow brush for application and blending of the shadows. There are three 'treasury' palettes to choose from; Gold, Rose Gold and Silver, with the Gold palette containing mostly warm toned neutral shades, the Rose Gold contains more colourful shadows and the Silver palette contains more cool toned neutral shades. I love a good neutral palette and opted for the Gold palette as I prefer more neutral toned eyeshadows for everyday use. The palette contains a mixture of finishes with matte, satin, shimmer and glitter shades with a good mixture of tones from very pale creams through to an intense black giving you endless eyeshadow look possibilities. The pigmentation is pretty decent considering how affordable it is but they perform best when used with an eyeshadow primer. The W7 Electric Eye Massager is intriguing as it's a battery operated device with a rounded metal tip which you can place on the whole eye contour area. It claims to reduce fine lines and wrinkles, as well as offering a soothing and relaxing massage to the eyes. I've never used an electric eye massager before so I didn't know what to expect but it's an amazing little tool which I love using whenever my eyes are feeling super tired or especially puffy thanks to hayfever. I'm not entirely sure if it will help to reduce fine lines and wrinkles but it certainly does feel soothing and relaxing to use, and it's an enjoyable step within my skincare routine. We hope you found this new beauty launches roundup helpful. We'd love to know if you've tried any of these products yet?